Bayldonite: Mineral information, data and localities. Named in 1865 by Arthur Herbert Church in honor of English physician John Bayldon [1837(8) - April 6, 1872 Melbourne, Australia]. Bayldon received degrees from University of Edinburgh and University of London. In the late 1850's, Bayldon was lecturer of botany at the Royal College of Surgeons at Edinburgh. While in Edinburgh, he also published observations of geological and botanical subjects. He emigrated to Australia in 1866 for health reasons. He became surgeon and medical officer of the Melbourne Benevolent Asylum, and, for a short time before his death from Bright's Disease, was the Superintendent of the Ararat Lunatic Asylum. It is widely stated that John Bayldon found the original specimens. He did not. Church (1865) specifically states that the specimen came from a mineral dealer Mr. [Richard] Talling, who had supplied Church with a number of new species. A relatively rare secondary mineral occurring in the oxidized zones of polymetallic deposits. Crystals rare. Common as mammillary crusts with a fibrous structure; fine-grained massive; pulverulent. Pseudoscalenohedral trillings with the composition plane (311). Grass-green to blackish green mammillary masses. It is commonly reported the type specimen is BM 1921,433 at the Natural History Museum, London, England, UK. This is however incorrect - the specimen that has the strongest links with the analyses of A. Church is BM 1964,R8217, also at the NHM, London. Azurite 63 photos of Bayldonite associated with Azurite on mindat.org. Mimetite 51 photos of Bayldonite associated with Mimetite on mindat.org. Malachite 43 photos of Bayldonite associated with Malachite on mindat.org. Quartz 31 photos of Bayldonite associated with Quartz on mindat.org. Cerussite 19 photos of Bayldonite associated with Cerussite on mindat.org. Beudantite 11 photos of Bayldonite associated with Beudantite on mindat.org. Arsentsumebite 10 photos of Bayldonite associated with Arsentsumebite on mindat.org. Agardite-(La) 8 photos of Bayldonite associated with Agardite-(La) on mindat.org. Mixite 8 photos of Bayldonite associated with Mixite on mindat.org. Conichalcite 8 photos of Bayldonite associated with Conichalcite on mindat.org. Soluble in HCl with difficulty. Lacroix, A. (1910) Minéralogie de la France et des ses colonies, Paris. 5 volumes: vol. 4: 513. Biehl (1919) Inaugural Dissertation Münster (as Parabayldonite, Cuproplumbite). Biehl (1921) Min. Abstracts: 1: 202 (as Parabayldonite, Cuproplumbite). Larsen, E.S. (1921) The Microscopic Determination of the Nonopaque Minerals, First edition, USGS Bulletin 679: 45. Biehl (1925) Zeitschrift für Kristallographie, Mineralogie und Petrographie, Leipzig: 62: 341 (as Parabayldonite, Cuproplumbite). Cesbron, F. and H. Vachey (1974) The unit cell and twin of bayldonite. Mineralogical Magazine, 39, 716–718. Ghose, S. and C. Wan (1979) Structural chemistry of copper and zinc minerals. VI. Bayldonite, (Cu, Zn)3Pb(AsO4)2(OH)2: a complex layer structure. Acta Crystallographica: B35: 819–823. Siuda, R., & Kruszewski, Ł. (2006). New data on bayldonite, cornwallite, olivenite and philipsburgite from Miedzianka (Rudawy Janowickie Mts., Sudetes, Poland). 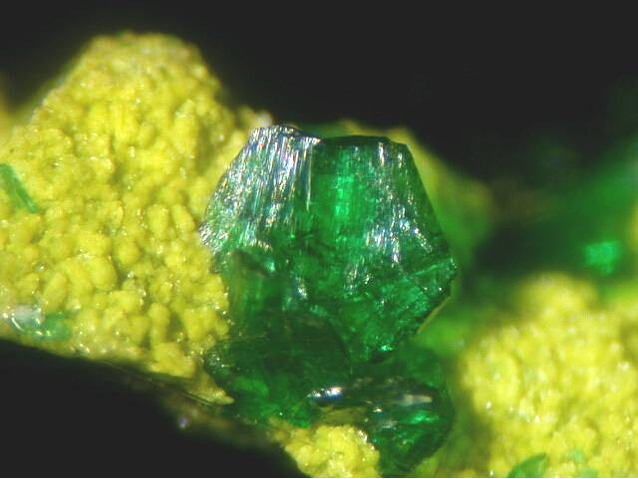 Mineralogical Society of Poland–Special Papers, 28, 202-204. Camm, J. S., & Merry, M. G. H. (1991). Bayldonite and its associates from Penberthy Croft Cornwall. UK J. Mines Minerals, 9(6), 15. Yi, L. L. L. (1991). DISCOVERY AND STUDY of BAYLDONITE. Mineral Resources and Geology, 6, 008. Kloprogge, J. T., & Wood, B. J. (2017). X-ray Photoelectron spectroscopic and Raman spectroscopic study of bayldonite from Wheal Carpenter, Cornwall, UK. Vacuum, 141, 49-56. The following Bayldonite specimens are currently listed for sale on minfind.com. The Daydream Mine, G.D. Grose, Bungala Press 2002. The reference refers to minerals collected at the mine and identified by John Leach. Lapis 29(9):9-11 (2004). Nickel, E.H., Gartrell, B.J. (1993) Secondary Minerals of Ashburton Downs Western Australia, Mineralogical Record (May-June 1993) 24:3: 203-218. Walenta, K. (1992): "Die Mineralien des Schwarzwaldes", Weise (Munich). K. Walenta: "Die Mineralien des Schwarzwaldes", Weise (Munich), 1992; Gröbner, J. (2007): Neufunde von der Eichhalde bei Biberach im Kinzigtal. Erzgräber 21, 21-26.
www.haldengraeber.de/Homepage/Fundstellen/Deutschland/Taunus/Silbergaut/Silbergaut.html; Sterrmann, G. & Schäfer, T. (2016): Die Mineralien der Grube Silbergaut bei Emmershausen im Taunus. Mineralien-Welt 27 (4), 38-47 (in German). Anthony, Bideaux, Bladh, Nichols: Handbook of Mineralogy, Vol. IV; Morrissey, C. J. (1970) The Mineralogy, Structure and Origin of the Lead-zinc-copper Residual Orebody at Tynagh, County Gamay, Ireland (Doctoral dissertation, Imperial College of Science and Technology London). Biffi, P., Sbacchi, M., Sinelli, E. (2004) Gli arseniati di Cava del Prete e altre novità mineralogiche dal granofiro di Cuasso al Monte (Varese). Rivista Mineralogica Italiana, 28, 4 (4-2004), 232-239; Guastoni, A., Gentile, P., Nestola, F., Zorzi, F. (2017): Agardite-(Y), agardite-(Ce) e agardite-(Nd) di Cuasso al Monte, Varese. Rivista Mineralogica Italiana, 41, 4 (4-2017), 228-232. Guastoni, A. (2009): Monte Cervandone. Recenti novità mineralogiche. Rivista Mineralogica Italiana 2009 (1), 38-48. Palache, C., Berman, H., & Frondel, C. (1951), The System of Mineralogy of James Dwight Dana and Edward Salisbury Dana, Yale University 1837-1892, Volume II: 663, 861. Kingsbury, A.W.G. and Hartley, J. (1960) Carminite and beudantite from the northern part of the Lake District and from Cornwall. Mineralogical Magazine, vol. 32, n° 249, 423-432.; Goley, P. and Williams R. (1995) Cornish Mineral Reference Manual. Endsleigh Publications. ; Kloprogge, J. T., & Wood, B. J. (2017). X-ray Photoelectron spectroscopic and Raman spectroscopic study of bayldonite from Wheal Carpenter, Cornwall, UK. Vacuum, 141, 49-56. Sumin De Portilla, V., Portilla Quevedo, M., and Stepanov, V.I. (1981) The structure of bayldonite: chemical analysis, differential thermal analysis, and IR spectroscopy. American Mineralogist, 66, 148-153.; Cooper, M.P. and Stanley, C.J. (1990) Minerals of the English Lake District: Caldbeck Fells. Natural History Museum Publications, London, 160 pp. ; Camm, G.S. and Merry, M. (1991) Bayldonite & its associates from Penberthy Croft, Cornwall. U.K. Journal of Mines and Minerals, 9, 6-15. ; Golley, P. and Williams, R. (1995) Cornish Mineral Reference Manual. Endsleigh Publications, Truro, Cornwall. Kingsbury, A.W.G. and Hartley, J. (MS) (1951) New occurrences of rare minerals in the northern part of the English Lake District: part 1.; Hartley, J. (1984) A list of minerals associated with the ore deposits of the Caldbeck Fells, Cumbria. Transactions of the Leeds Geological Association, 10(3), 22-39.; Cooper, M.P. and Stanley, C.J. (1990) Minerals of the English Lake District: Caldbeck Fells. Natural History Museum Publications, London, 160 pp. (referring to Kingsbury & Hartley, 1951 and Hartley, 1984). Kingsbury, A.W.G. (MS1) (1953 or later) Investigation of the minerals of the Lake District, especially the Caldbeck area, in collaboration with J. Hartley. List of minerals found by us at many localities examined 1947-.; Cooper, M.P. and Stanley, C.J. (1990) Minerals of the English Lake District: Caldbeck Fells. Natural History Museum Publications, London, 160 pp. (referring to Kingsbury, 1953). ; Green, D.I., Rumsey, M.S., Bridges, T.F., and Thomson, N. (2009) A Review of the mineralisation at Ingray Gill, Caldbeck Fells, Cumbria. Journal of the Russell Society, 12, 33-45. (referring to Kingsbury, 1953). Cooper, M.P. and Stanley, C.J. (1990) Minerals of the English Lake District: Caldbeck Fells. Natural History Museum Publications, London, 160 pp. ; Bridges, T.F. and Green, D.I. (2008) Baryte formation in supergene environments in the Caldbeck Fells, Cumbria. Journal of the Russell Society, 11, 48-50. Kingsbury, A.W.G. and Hartley, J. (MS) (1951) New occurrences of rare minerals in the northern part of the English Lake District: part 1.; Hartley, J. (1984) A list of minerals associated with the ore deposits of the Caldbeck Fells, Cumbria. Transactions of the Leeds Geological Association, 10(3), 22-39.; Young, B. (1987) Glossary of the minerals of the Lake District and adjoining areas. British Geological Survey, Newcastle upon Tyne, 104 pp. ; Cooper, M.P. and Stanley, C.J. (1990) Minerals of the English Lake District: Caldbeck Fells. Natural History Museum Publications, London, 160 pp. (referring to Kingsbury & Hartley, 1951, Hartley, 1984, and Young, 1987). Davidson, W.F. and Thomson, N. (1951) Some notes on the minerals of Westmorland and Cumberland. North West Naturalist, 23 (for 1948), 136-154.; Kingsbury, A.W.G. and Hartley, J. (1956) New occurrences of vanadium minerals (mottramite, descloizite, and vanadinite) in the Caldbeck area of Cumberland. Mineralogical Magazine, 31(235), 289-295.; Kingsbury, A.W.G. and Hartley, J. (1960) Carminite and beudantite from the northern part of the Lake District and from Cornwall. Mineralogical Magazine, 32(249), 423-432.; Hartley, J. (1984) A list of minerals associated with the ore deposits of the Caldbeck Fells, Cumbria. Transactions of the Leeds Geological Association, 10, 22-39.; Cooper, M.P. and Stanley, C.J. (1990) Minerals of the English Lake District: Caldbeck Fells. Natural History Museum Publications, London, 160 pp. ; Cooper, M.P. and Stanley, C.J. 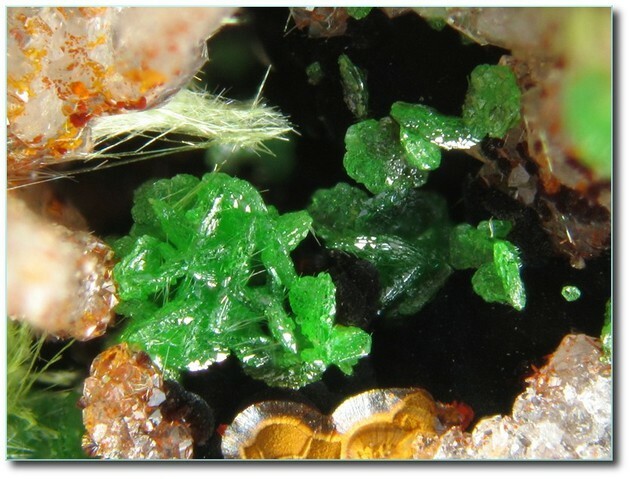 (1991) Famous mineral localities: Pyromorphite group minerals from the Caldbeck Fells, Cumbria, England. 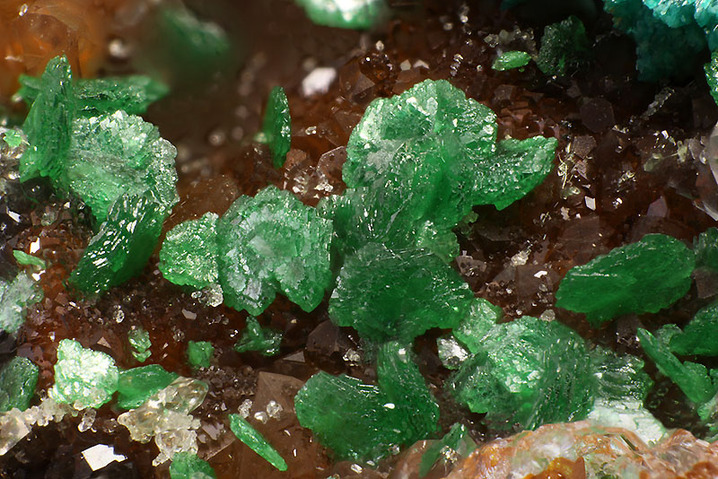 Mineralogical Record, 22(2), 105-121. Anthony, J.W., et al (1995), Mineralogy of Arizona, 3rd.ed. : 130; Graeme, R. (1993), Bisbee revisited, Min.Rec. : 24: 421-436. Anthony, Bideaux, Bladh, Nichols: Handbook of Mineralogy, Vol. IV; Anthony, J.W., et al (1995), Mineralogy of Arizona, 3rd.ed. : 130. Murdoch, Joseph & Robert W. Webb (1966), Minerals of California, Centennial Volume (1866-1966): California Division Mines & Geology Bulletin 189: 100. Tucker, W. Burling (1924a), Imperial, Inyo, Kern, Los Angeles, Riverside, San Bernardino, San Diego, Ventura Counties: California Mining Bureau. Report 20: 195; Palache, Charles, Harry Berman & Clifford Frondel (1944), The System of Mineralogy of James Dwight Dana and Edward Salisbury Dana Yale University 1837-1892, Volume I. John Wiley and Sons, Inc., New York. 7th edition, revised and enlarged, 834pp. : 200; Murdoch, Joseph & Robert W. Webb (1966), Minerals of California, Centennial Volume (1866-1966): California Division Mines & Geology Bulletin 189: 164. Murdoch, Joseph & Robert W. Webb (1942), Notes on some minerals from southern California, III: American Mineralogist: 27: 323-330; Murdoch, Joseph & Robert W. Webb (1966), Minerals of California, Centennial Volume (1866-1966): California Division Mines & Geology Bulletin 189: 100; Pemberton, H. Earl (1983), Minerals of California: 323. Ream, L. (2005): Segnitite and other secondary minerals at the Ima Mine, Lemhi County, Idaho. Mineral News, 21, 4-5. Waisman D. (1992) Minerals of the Black Pine Mine, Granite County, Montana Mineralogical Record, Vol. 23 No. 6, p. 477-483.; Gobla, M. J. (2012) Montana Mineral Locality Index. Rocks and Minerals 87:208-240.